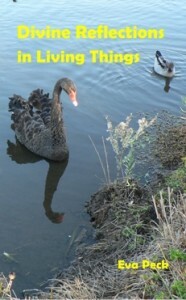 Divine Reflections in Living Things explores what living things can show us about life and spiritual realities. The reality that daily surrounds us is far greater than what we can perceive with our limited senses. Countless camouflaged living things – both plants and animals – come across our paths but may totally escape our attention. In a similar way, there is camouflaged divinity in every nook and cranny of the created order. Divine Reflections in Living Things (as well as its two companion titles, Divine Reflections in Times and Seasons and Divine Reflections in Natural Phenomena) encourage us to open our eyes and take a fresh look at what is around us – to see each living thing and every process as if for the first time. For a preview of the book and purchase information in paperback and hard cover, click on the image. NOTE: This book placed among the finalists in the recent Christian Indie Authors Networks (CIAN) contest and is available from the Network’s bookstore at Amazon. See http://www.amazon.com/Eva-Peck/e/B00DH68WPE for its companion volumes and the author’s other books. 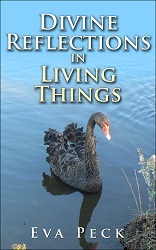 Australian readers may find a better value for Divine Reflections in Living Things at Fishpond which sells discounted books and delivers them postage-free. Also downloadable as a free ebook in PDF format at http://www.free-ebooks.net and from this website at Divine Reflections in Living Things. If you like the book, please consider writing a review on Amazon, Goodreads, and/or Free e-books. See a video trailer for the Divine Reflections trilogy. Your style of writing is very readable and sympathetic, and the way you reflect on the beauties of nature is lovely. Your message and discussion is soft and gentle and makes the reader feel God’s love. The reflections on God’s creation were delightful – it is so true, as the Bible tells us in Romans, that we can see the proof of the Creator in His handiwork all around us. I really liked these reflections and feel like universal truths come through and the words spoken are honest. I especially like the part about “lessons from desert cats”. It is so sweet and delicate to think about animals in that way. It is amazing how God works. It is easy to see pigeons fighting, but very difficult to understand the messages they are sending. Thank God that He gives people wisdom to understand and share with others. Feel free to add a comment or review Amazon, Goodreads, and/or Free e-books.